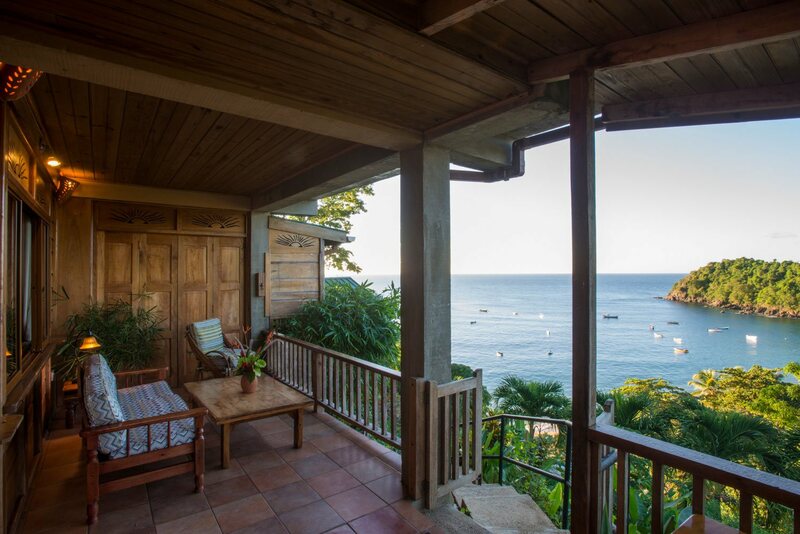 One of our original accommodations, Hummingbird 1 showcases the ‘living in the landscape’ concept with fabulous views through our tropical gardens to Castara Bay. Hand-crafted from local hardwoods, this apartment optimises the feeling springing out to the environment in which it was built. Hummingbird 1 enjoys a spacious 20 foot long covered terrace with views to the beach, ocean and coastline. The outside private terrace has Easterly views across the village to the rainforest ridge in the distance. Surrounded by tropical gardens, it is fabulous for al-fresco dining and watching the stars. Living up to its name, hummingbirds feeding from the surrounding tropical flowers are a regular spectacle, along with a range of other birdlife – bananaquits have even nested in the candle holders that we provide for each accommodation! Hummingbird 2 adjoins Hummingbird 1 and it is possible for two couples or a family to rent both these apartments. When the wooden dividing wall between the terrace areas is retracted it creates a spacious 32-foot terrace that spans the whole front of this accommodation.